Diamond cookies are tender butter cookies that act as a blank palette for flavors such as vanilla, chocolate, praline, pistachio or lemon. 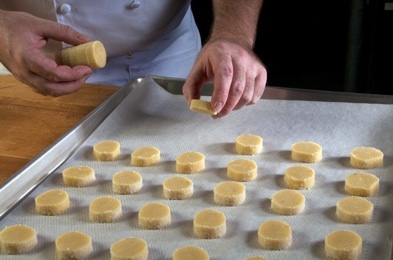 These treats originate from France (and are considered petit four sec) but their formulation is similar to what many American bakers know as “icebox cookies.” What makes the diamond cookie unique is its formulation, makeup and presentation: a perfectly round cookie, studded with sugar on the outside edge. The basic diamond cookie is made from flour, butter, sugar and egg. Because the ingredients selection is so minimal, the quality of the ingredients must be high in order to have the desired texture: ethereal, light, crisp and tender. Cookie dough needs a balance of ingredients that toughen and tenderize. The balance of these two properties is what allows bakers and pastry chefs to create the many types and styles of cookies we know. Included in the list of ingredients that toughen are flour, starch, cocoa powder, non-fat milk solids, salt, water, milk, whole eggs and egg whites. Ingredients that tenderize include liquid and solid fats, sugars (granulated, superfine and liquid), egg yolks, baking powder and baking soda. Diamond cookies benefit from the use of low protein bread flour because of its ability to create just enough strength in the dough. The use of a strong flour is balanced by the high quantity of unsalted butter and powdered sugar. 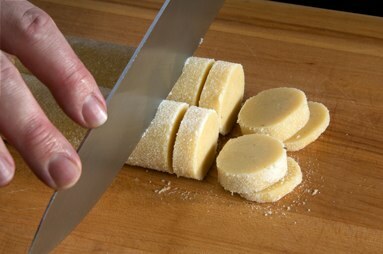 There are two types of sugar used in diamond cookies. Powdered sugar goes in the dough to make a smoother and more compact dough and granulated sugar is used on the outside of the cookie just before baking. This gives the glittery, textured appearance of a diamond. •Classic creaming method: Based on the blending of butter and granular sugar. The main function is to incorporate air to lighten texture and promote spread. •Sponge method: Based on various egg foams to create a light matrix of air bubbles as the base for batters used for products like langue du chat or Parisian macaron. •Sablér, or Sanding Method: Based on blending cold butter into the dry ingredients and then adding eggs and or liquids. This is the classic technique used for tart dough and cookie dough that must exhibit little to no spread. •Soft Butter Creaming Method: When compact dough is needed, with limited spread, the creaming method is used but with a modification in ingredient characteristics: the butter must be very soft as to limit air incorporation. Formulas that are made using the soft butter creaming method may also be made using the sablér or sanding method. The end result is the same: we achieve a dough with butter spread through out yet there is almost no air incorporation during the process. The compact texture of a dough limits spread and shrinkage while increasing the tender properties of the final product. 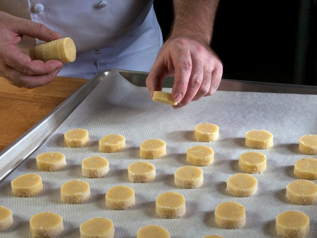 For practical purposes, most people now use the soft butter creaming method in the production of tart dough and products like Diamond Cookies because there is more consistency in the final product. Before beginning the mixing process, all ingredients should be ready: butter should be soft; eggs should be room temperature (65-70F); powdered sugar (and any other lumpy ingredients) should be sieved. Once all is in place, the butter can be mixed with the paddle attachment to make it smooth. Next the powdered sugar is added and mixed in on low speed and then the egg can be added and blended in until incorporated. (See Figure 1). 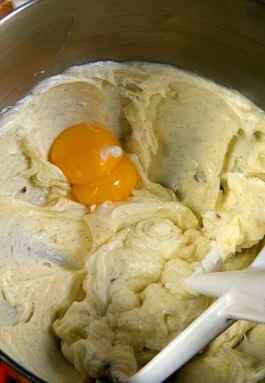 It is important to not mix too long once the sugar is added and to use egg that is a similar temperature to the butter. Over mixing once the sugar is added can run the risk of adding too much air to the dough and cooler egg temperatures can cause the fat to become cold. If the fat becomes cold, it is more difficult to have it spread evenly throughout the dough. Next, the flour (and other dry ingredients such as cocoa powder) is added and mixed to incorporation. After mixing, reserve the dough in the refrigerator to cool it down so it is easy for handling later. Diamond cookies are typically a round disc shape. 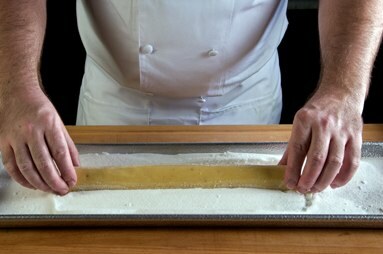 In order to achieve this shape the dough is portioned by weight, rolled into logs and reserved in the refrigerator or freezer until needed. If well wrapped, unbaked dough has a shelf-life in the freezer for several weeks. The dough can be stored for several days in the refrigerator. As needed the dough is finished by lightly brushing with egg, dredging in granulated sugar and then cutting into individual portions. (See figures 2, 3 and 4). This last step should be done just before baking to ensure the sugar does not dissolve (in the refrigerator). 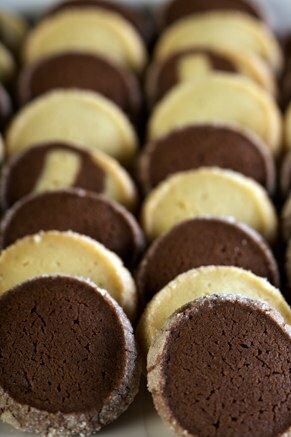 The cookies are baked at a moderate temperature (300-325F) to ensure they bake through, yet don’t take on much color. Once baked and cool, the cookies are good for several days or longer if packaged for sale in plastic. Why Not Make Some Diamonds? Diamond cookies are an easy and inexpensive product to produce. Even though butter is called for in the ingredients list, the cookie has a low food cost and a low labor cost. Following a few simple guidelines for process, storage and baking, Diamond cookies are an easy addition to any product line-up and add nice visual diversity. So make some Diamonds and add another highly addictive product loved by adults and kids alike. Diamond Cookies are tender butter cookies very similar to “icebox” cookies. Add them to your repertoire: it is easy to produce “fresh baked” cookies from freezer stock with excellent quality. Once the dough is cold, roll it into logs. next, brush lightly with egg wash and dredge in sugar. The soft butter creaming method incorporated hardly any air. Once the sugar/fat phase is smooth, add the egg yolks (or whole eggs) and mix to incorporate. Slice the log into the cookies. Be careful to slice evenly so the cookies all bake at the same rate. Also, the cookies will look so much nicer if they are all the same size. Place the cookies on a parchment lined sheet pan. They can be place somewhat close because they shouldn’t spread during baking. Finished cookies keep well in packaging for at least a week. Alternately, sell by the each. An array of colors and flavors, or using marbling techniques provides a great display for this simple but tasty treat.